An identikit pub that sums up modern Britain. That one of my drinking partners had ventured in 3 times over a 15 year period says it all. Utterly anodyne and uninteresting and fully representative of the drinking opportunities on offer in the UK's most successful new town. A fantastic pub! I love the food and the staff are really friendly. 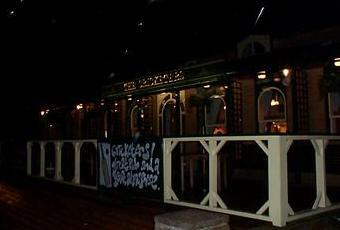 They have a nice atmosphere and its one of the pubs where you can enjoy your food and drink! Defiantly a pub to try! Been here many years ago as my uni mate lived over the road on the estate and we dropped in for a good few swifties. The beer good and the locals made me very welcome so it's gets my nod..
Archetypal MK estate pub on an archetypal MK estate. A contived kind of place lacking identity (typical of most of MK). Has the front area set out as a kind of restaurant while thepub area doesn't have a great deal of seating. Sky sports, lager etc reigh supreme here - they had an ale on but I didn't fancy risking it. Was served Stella in a Becks Vier glass (macho wifebeater lager served in a poncey lower alco glass - such lack of class!) The darke pic does give a true dismal reflection of the place.